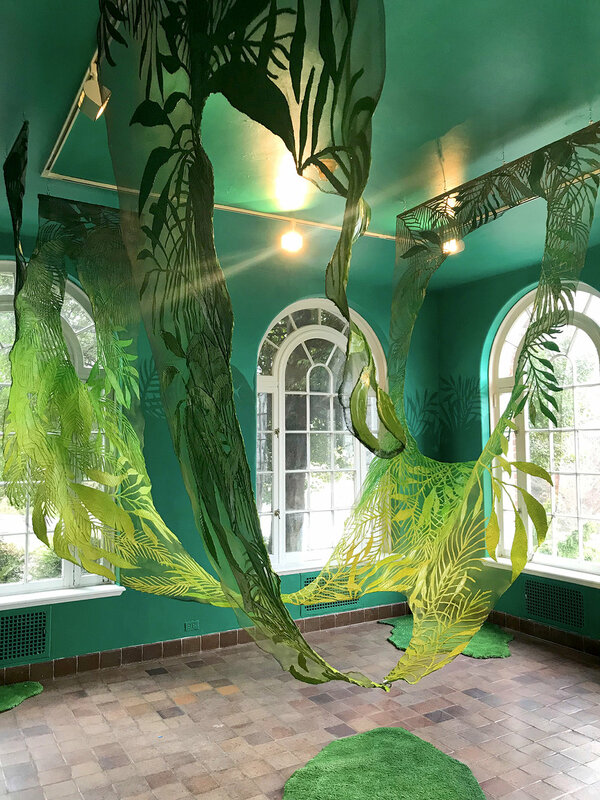 Reversing the Sunroom’s traditional function to offer views of the outdoors from an interior shelter, Adrienne Elise Tarver builds tactile paintings hanging from the ceiling inside the gallery to evoke a tropical landscape and canopy. In creating these forms from the wire mesh of window screens and other household materials, Tarver examines the physicality of boundaries, as well as the invisible and imaginary ones that exist between us. Tarver began this body of work in Australia, where her assumptions about domesticized tropical plants were subverted and the inhabitants’ assumptions about her identity were pronounced. Her hanging paintings reference the visible and invisible “veils” of race and otherness as discussed by W.E.B. DuBois in The Souls of Black Folk. Tarver notes that European painters, such as Paul Gaugin and Henri Rousseau, and the human zoos of the 19th and 20th centuries in Western countries exoticized the “other” and created fictions surrounding non-Western people from tropical lands and African countries and their lifestyles. Tarver’s work examines multiple dichotomies: the natural and manmade, private and public, and inclusion and exclusion.